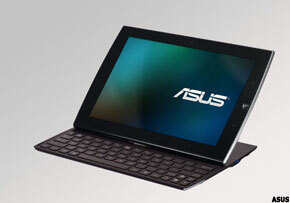 Asus unveiled a host of tablets at CES Tuesday evening. Here's a roundup. LAS VEGAS (TheStreet) -- Tablets running Google's (GOOG - Get Report) Android operating system will dominate the 2011 Consumer Electronics Show in Las Vegas this week. With a new Apple ( AAPLiPad likely on the way and Samsung rumored to be cutting prices on its 7-inch Galaxy Tab, "me too" tablets look to jump in and offer choices to shoppers who aren't sure what to do about the next small computer purchase. Asus, best known for powering the short-lived netbook revolution, unveiled four tablets Tuesday evening in what amounts to digital spaghetti flung against the wall -- something is bound to stick. Last year, Lenovo showed off a tablet, but never launched it. Now that same tablet is back in different iterations, one powered by Android and another powered by Microsoft ( MSFT - Get Report) Windows. The multi-OS approach is a lather-rinse-repeat approach to the consumer space that leaves some tech watchers wondering just who these tablets are aimed at. The Asus Eee Pad slider (pictured above) in the most interesting of the bunch. The model, with a 10-inch screen, is the closest to the iPad, but the kicker is the slider: it's a keyboard that comes off the bottom and displays at an angle. With a $699 starting point, the slider prices itself out of the market. That's far more than your basic netbook -- which this slider emulates -- and the slider offers nothing feature-wise to separate it from the onslaught of tablets expected over the next four days. Asus brags that the tablet's Nvidia ( NVDA - Get Report) Tegra 2 processor provides support for Adobe ( ADBE Flash, HD video conferencing, speedy browsing and gaming. Even with the 3G option down the road, the Slider may have a hard time breaking out of the pack. The eee Pad Transformer, hmm. Do we hear copyright issues with the toys and the Megan Fox movie? This device has the same guts as the slider. A 10-inch screen, Nvidia processor, dual cameras and Android 3.0. Aimed at business users, it can dock with a traditional QWERTY keyboard. With its mini-HDMI port, you can take advantage of the HD playback and same features of the slider. What Asus failed to specify was if the docking station is included in the price range of $399 - $699. This price point is far more in line with Asus' netbook history and is better positioned to compete with other tablets. How you feel about Windows on a tablet will determine if you like the Eee Slate, which comes in at 12.1 inches and features an Intel ( INTC - Get Report) Core I5. This beefy tablet was impressive during demos with HD playback and multitasking Photoshop. The catch? It runs Windows 7. Tablet purists will argue that if it's now powered by iOS or Android, it's DOA. Business users, however, may feel differently. Not every IT team on the planet is going to allow those operating systems on their network, so this Slate could be your beefy work tablet. With 32 or 64 GB of SSD on board and up to 4GB of DDR3 RAM, this new entrant is incredibly powerful. The Slate goes on sale later this month with a $999 - $1,099 price tag. The Eee MeMO (not memo, Me-MO) continues Asus' attempt to break into the handheld space. MeMO may be too underpowered: It sports a Qualcomm ( QCOM Snapdragon, but heavy smartphone users are waiting for dual-core phones from HTC and others. The form will immediately remind you of the Samsung Tab, right down to the 7-inch screen. Asus has made this a stylus device for no clear reason. The high price point of $499 - $699 makes this a tough sell. We'll know when it hits shelves in June. --Written by Bill McCandless in Las Vegas. >To follow the writer on Twitter, go to http://twitter.com/TheStreet_Tech. Bill McCandless is the executive editor for multimedia at TheStreet.